A set of tax rates are required. 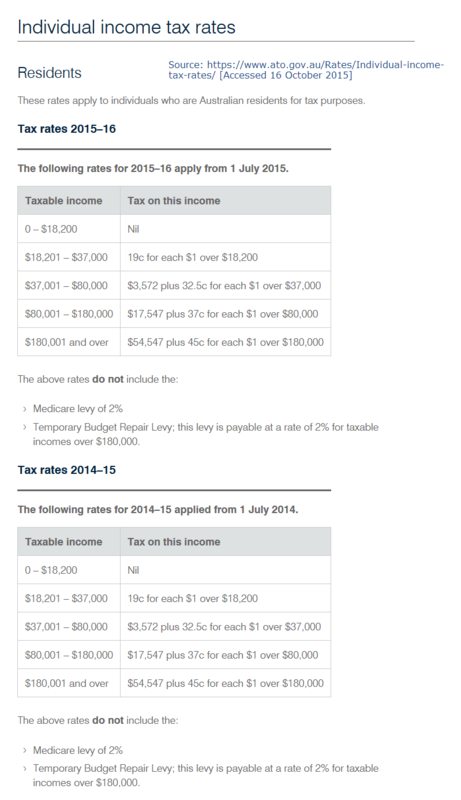 These are available from the Australian Taxation Office (ATO) web site and are included here for your reference. As a preliminary exercise it is suggested that the tax rates for one year are entered into a 5 row by 3 column array in a worksheet. The Excel range should be suitable for use with the Excel VLOOKUP function. As an example, the 2015-16 tax rates (this is the first dimension, 2016 index developed later in VBA), is shown in the yellow section of Table 1 in figure 1. The table "information" needs its appropriate numeric values to be entered into the 15 available cells in the area shown by the selection on the worksheet "Sheet1". 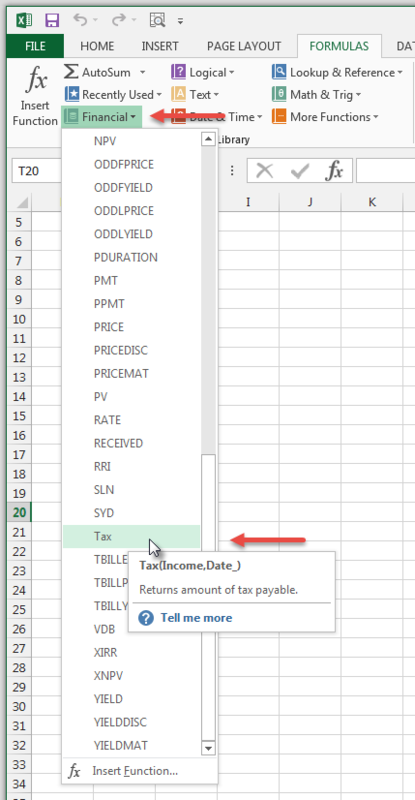 You can then use VLOOKUP (in Excel) to return the amount of tax payable. Once you understand the logic, you can then assign the tax values to the elements of the 3-D array in VBA. Code structure: the public Tax function in part c, calls the 2-D array from the private function in part b, which in turn uses the 3-D array from part a. Fig 2: Tax 2015-16 - as a worksheet 5 x 3 array (B18:D22 with column B in ascending order). 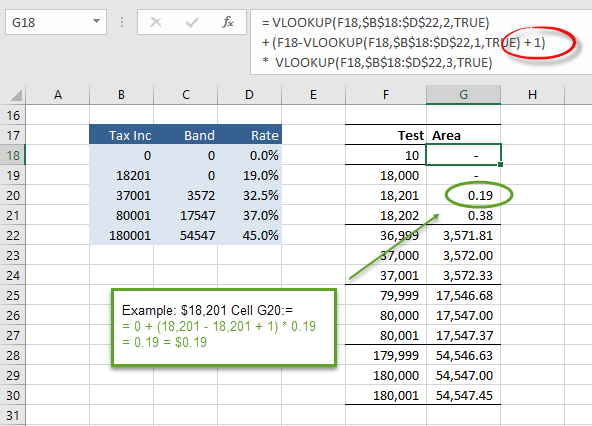 In the case of an approximate match, the VLOOKUP function will look for the next largest value that is less than the lookup value. QUESTION a Tax rates: Write a Private procedure to assign a set to tax rates to a VBA array. The rates apply to an Australian resident individual, and are for tax years 2010 to 2016 inclusive (excluding the Medicare levy). The array is static, with dimensions (2010 to 2016, 1 to 5, 1 to 3). In the first dimension, 2010 refers to tax rates for the tax year 2009-10, and so on. 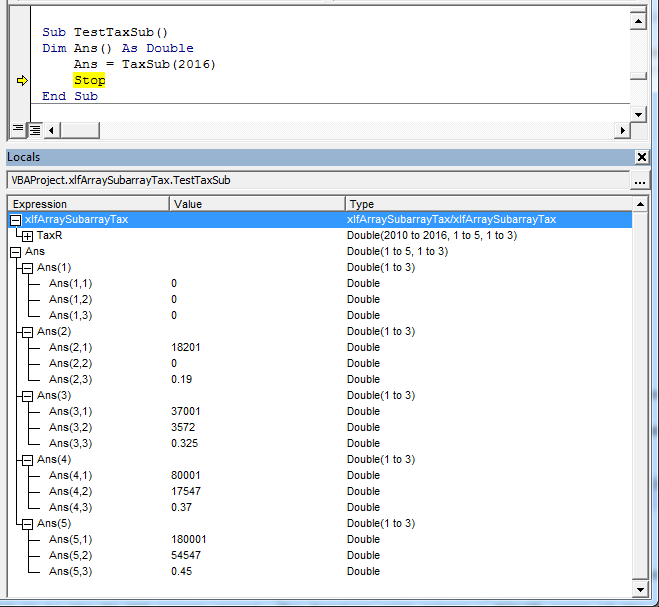 Use assignment statements to populate the array. QUESTION b Sub array: Write a Private function procedure to return the second and third dimension (ie. a two dimensional sub array) for a specific tax year, from the array developed in part a. Assume that this function is only called from VBA, and not from a worksheet. QUESTION c Tax: Tax: Write a Public function named Tax, categorized in the WS Financial group, that returns the tax values, based on an amount of taxable income, and a date within a specific tax year. For example, Tax(54000, DATEVALUE("31-Dec-2010")) will apply the Tax Schedule for 2010-11 to the 54,000 income amount. The function will return a #VALUE error if the date is out of range. FuncDesc = "Returns amount of tax payable"
'' FuncArgDesc(1) = "the amount of taxable income"
'' FuncArgDesc(2) = "the serial date value in the tax year"